Retinal degeneration is the major cause of impaired vision and blindness. Understanding the mechanisms of retina development and degeneration will show scientists the way to the prevention and treatment of vision malignancies. More than 15 million Europeans have problematic vision, while 2.7 million are blind. These numbers are rapidly increasing mostly due to the ageing of the population in Europe and diseases like diabetes. The most common causes of impaired vision and blindness are age-related macular degeneration (AMD) and numerous rare inherited retinal degenerations (IRDs). The mechanisms of the development of these retinal disorders and their evolution to blindness are poorly understood. Consequently, there is a lack of successful therapies for the prevention and repair of retinal damage. In order to shed more light on the molecular and cellular mechanisms involved in retinal development and function, the EU-funded 'Functional genomics of the retina in health and disease' (EVI-Genoret) project was initiated. EVI-Genoret scientists focused on the elucidation of the role of specific genes and pathways in the development of the retina and changes in their action brought about by mutations, environment and age. Academic and industrial scientists joined their multidisciplinary efforts and experiences in an integrated network, including phenotyping, genotyping, functional gene analysis, development and therapeutic strategies. For this purpose, cutting-edge technologies and methods were combined, including transcriptomics, proteomics, protein-interactome analyses, functional cellular and biochemical assays, bioinformatics and model organisms. The established working platforms were intensively used as a valuable tool for partner interaction, and transfer of knowledge and resources. In order to bridge research on vision biology with clinical studies for retinal blindness, an accurate clinical and molecular classification of retinal degenerations was performed. This classification included the determination of novel retinal genes and pathways that significantly modulate the development of degeneration. Moreover, a major achievement of EVI-Genoret was the creation of biological models for the study of essential molecular pathways involved in retinal health and disease. A database and a website were created within the project for the accommodation and integration of the massive amount of biological and clinical data produced. 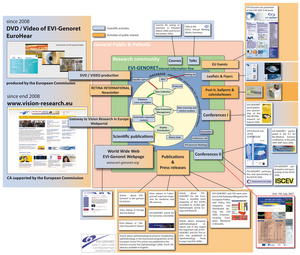 The standard operation procedures (SOPs), resources and data were organised in the database, where they were made available to the members of EVI-Genoret as well as the scientific community. 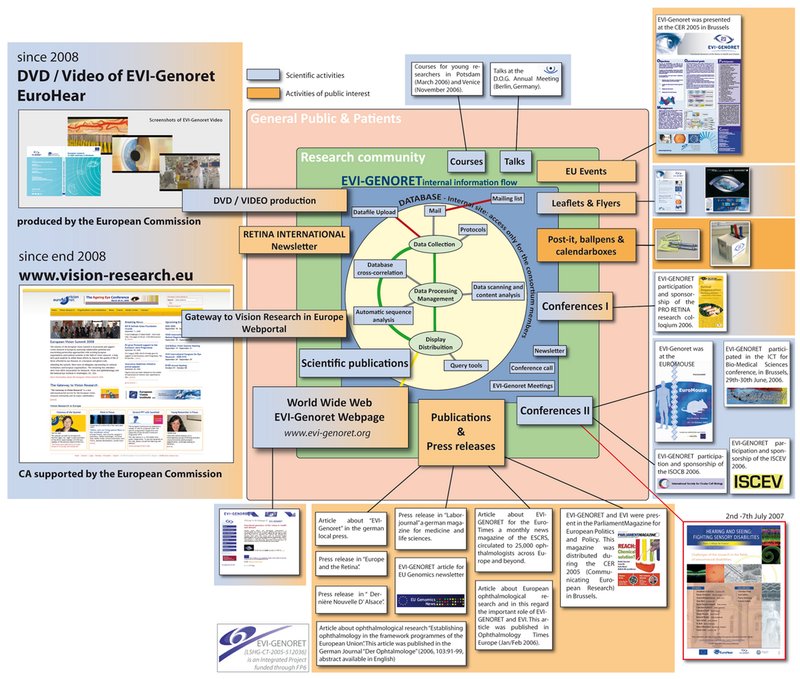 The EVI-Genoret consortium established infrastructures and networks producing at the same time a massive amount of new knowledge in the field of retinal biology. These resources will significantly facilitate the identification and validation of novel therapeutic targets.